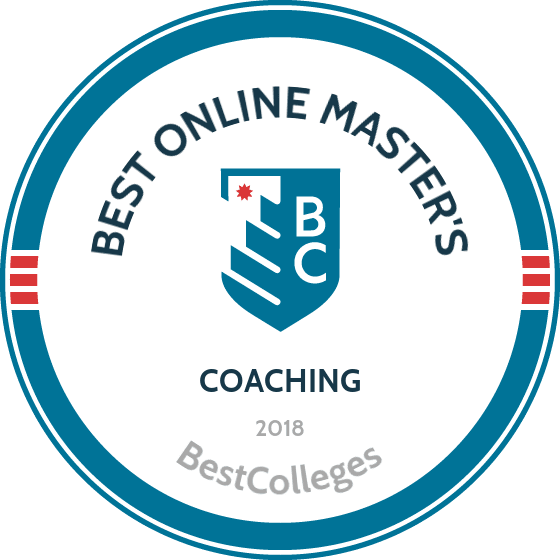 What Are The Best Online Master's in Coaching Programs? What Else Can I Expect From an Online Master's in Coaching Program? An online master's in coaching degree equips graduates with the fundamentals of coaching high school, college, or professional athletes. Successful coaches must consider educational methods and pedagogy just like their classroom counterparts, as well as long-term athletic development, nutrition, exercise science, sports psychology, and organizational leadership. The Bureau of Labor Statistics predicts that coaching jobs will grow at a rate of 6% over the next 10 years. However, that number is directly tied to participation and popularity and is poised for growth the number of athletes and interest in sports increase. With youth participation strong and national college sport fandom at an all-time high, now is an attractive time for amatuer coaches and former athletes to earn a master's degree in coaching to improve their career prospects. A master's degree in coaching online is similar in many ways to a master's in education. Both programs provide foundational knowledge of the field, includes hands-on experiences, and allow students to earn a credential. Prospective students can find the best online master's in coaching for them by comparing multiple programs and examining several shared factors. Students should consider degree completion time, credit load, cost, course delivery, faculty interaction, and more. The most important factor is the curriculum and whether or not the program allows a student to pursue a focus or specialization that aligns with their career goals. CAN I WORK WHILE I COMPLETE MY ONLINE MASTER'S IN COACHING? Yes, in fact many students earning their coaching master's degree online are working professionals. Most programs features courses taught on-demand or with with live components on nights and weeks that are friendly to students who work full-time. These programs also commonly offer both full- and part-time completion plans, allowing working students to adapt their education around the needs of their schedule. WHAT ARE THE ADVANTAGES TO EARNING MY MASTER'S IN COACHING ONLINE? Earning a master's degree in coaching online is a smart option for many working coaches and teachers in the field. Online programs offer more flexibility and are more affordable and accessible than residential programs. Additionally, distance learning allows students to study coaching at the best universities in the country, regardless of geographic location. Students from across the Sunshine State can earn a master’s degree in coaching online from the University of South Florida. This public research university is located in Tampa and is home to a distance learning master’s of arts in physical education program that is well-suited for aspiring coaches and educators alike. This MA program is taught through USF’s school of physical education & exercise science and focuses on physical education methods and curriculum. It is aimed at working educators. To be eligible for this program, applicants should have an undergraduate GPA of at least 3.0 and either be a teacher or plan on becoming one soon. Programs of study vary depending on whether a student is already a teacher. Students complete required courses in instructional design and clinical supervision of physical education. All distance learners must also pass a comprehensive exam to graduate. Coursework in this 30-credit program is accessible through the Blackboard learning management system. The master’s of science degree in sports coaching & leadership program at Michigan State University is best-suited for students who want to become athletic directors, sports directors, and major sport coaches. Students pursuing a master’s degree in coaching online from MSU learn a scientific and comprehensive approach to coaching. The 30-credit online program is offered in a standard two-year format or in an accelerated 16-month format. Students take courses on safety and legality in coaching as well as coaching science, athlete development, and the psychology of coaching. There is also a capstone requirement. The program is taught in partnership with the MSU kinesiology department and the institute for the study of youth sports. Attractive applicants have a 3.0 GPA or higher, two letters of recommendation related to their coaching ability, an academic statement, and a strong resume. Students can join the proud Razorback athletics tradition by enrolling in the University of Arkansas’ online master’s of education in physical education degree program. Students pursuing this master’s degree in coaching online should be interested in working as physical education and health teachers or as coaches at any level, from elementary school through college. The program requires 33 credits of work and is typically completed in about two years. Students take 11 courses that are split between kinesiology and physical education, covering topics such as motor learning, risk management in physical education, and physical education curriculum. Distance learners are also required to complete a capstone project. Well-qualified applicants have a bachelor’s degree in kinesiology or a similar field with a GPA of 3.0 or higher. No GRE scores are required, and there are three starting points throughout the year. Teachers who also work as coaches may be interested in pursuing a coaching master’s degree online from the University of Nebraska at Kearney. Its master’s of arts in physical education is a great option for health/physical education specialists and working teachers. UNK’s program teaches students methodologies related to physical education and how to improve their curriculum and instruction techniques. Students learn about curriculum implementation, observation, analysis, review, and revision for classes and practice. The 36-credit program features two concentration options: pedagogy or special populations. The pedagogy emphasis focuses on teaching physical education to kindergarten through college students, while the special populations track focuses on physical education for students with disabilities; this track has an adapted physical education endorsement from the state’s department of education. Students have the option to complete a thesis or comprehensive examination. Applicants interested in obtaining a master’s degree in coaching online at UNK must have a bachelor’s degree and teaching certificate. Emporia State University, located about an hour southwest of Topeka, Kansas, features a master’s of science degree in health, physical education, and recreation (HPER) that can be earned completely online. Aimed at prospective educators and teachers who want to increase career opportunities, this graduate HPER degree includes 18 core credits and 15 credits of elective coursework. The entire program can be completed in two years (six semesters, counting summer terms). Students pursuing ESU’s coaching master’s degree online can choose from thesis and non-thesis options. ESU requires applicants to have a 2.5 overall undergraduate GPA and a 2.75 GPA over their final 60 credits. Students should also have a bachelor’s degree in a field related to HPER, such as athletic training or health sciences. GRE scores are not required, and students may transfer up to nine graduate-level credits to ESU. With a main campus in Muncie, Indiana, Ball State University offers a master’s degree in athletic coaching education. This program can be completed entirely online and does not have any on-campus requirements. BSU’s program covers a variety of topics, including organizational management, injury prevention, physical education in practice, planning and tactics, and team motivation. Students seeking this coaching master's degree online can complete the 30-credit program in five semesters. Distance learners enter into either a summer or spring cohort and have class sizes of 12 to 20 pupils throughout their time at BSU. Students are required to participate in an internship as part of their graduation requirements. Graduates from the BSU program have gone on to high-level coaching jobs in top college conferences, including the Big Ten and the Mid-American Conference. Most students enrolled in this program are active coaches at some level. Students can earn a master’s degree in coaching online from Drexel University. Its online master’s of science in sport coaching leadership program prepares students to become high-level coaches. The Philadelphia-based, private university teaches courses on NCAA compliance, recruitment methods, sports psychology, team budgeting, program development, and other business-related concerns of coaching. Students can concentrate in lacrosse or rowing; however, a custom-designed concentration can also be put together if a student is interested in a different sport. The curriculum is organized into four 10-week terms, and students must earn 45 credits to graduate. The program also includes several coaching practicums. All of the coursework is taught online but there is a seven- to 10-day international residency requirement. Applicants must have a bachelor’s degree and can apply by submitting transcripts, two letters of recommendation, a personal essay, and a resume. West Virginia University, home of the Mountaineers, offers a master’s of science degree in sport coach through its college of physical activity and sport sciences. The online master’s in coaching option is designed for students who want to become coaches at a high level for schools or private organizations. Students pursuing a master’s degree in coaching online at WVU learn about athlete development and sports science. Tuition rates for distance learners are the same, regardless of their state of residency. This 31-credit program can be completed in two years and features courses in coaching conditioning, positive youth development, education administration, and movement analysis. Students also have the opportunity to complete multiple internships. Applicants must have a bachelor’s degree and a minimum 2.75 GPA to be eligible for the MS program; undergraduate degrees in sports-related fields are preferred. Students can apply online and must submit two letters of recommendation, a personal statement of goals, and a coaching resume. Students can earn a master’s degree in coaching online from Norfolk, Virginia’s Old Dominion University. The master’s of science in sports management degree helps active or prospective coaches become better tacticians and organizational leaders. In addition to coaching, the program, which is taught through ODU’s department of human movement sciences, teaches students about the business of sports. This 36-credit online program takes about two years to complete and includes a capstone experience of either a thesis or fieldwork and a comprehensive exam. ODU also has a strong sports management internship program. To be considered, prospective students should have a bachelor’s degree, a minimum 2.8 cumulative undergraduate GPA, a 3.0 in-major GPA, and a combined verbal and quantitative GRE score of 291. Students must submit letters of recommendation, a resume, a statement of goals, and proof of computer literacy before being admitted. Georgia Southern University offers a master’s of science in kinesiology with a coaching education emphasis that can be completed entirely online. Open to both new and experienced coaches, the program covers several aspects of coaching, from the business side of things to training and performance enhancement. With a curriculum designed along the National Coaching Standards for Level-5 Coaching Status, this graduate degree helps students become high-level coaches. The 36-credit MS program features 12 classes taught over a period of about 15 months in a cohort format. Two classes are taught per term for six consecutive terms (i.e., two summer, fall, spring, and two summer terms). Classes include injury prevention, research methods for coaches, and biomechanics; there is also a coaching practicum. Applicants should have a bachelor’s degree with a 2.75 GPA. They must also submit a full resume, and all application materials are due by the beginning of April. The University of North Georgia’s master’s of science with a major in kinesiology teaches students about health, physical education, and coaching. This online master’s degree is aimed at active educators in K-12 schools who want to expand their knowledge, skills, and credentials. The 30-credit program has two concentration options: one in exercise science and another in health and physical education. Students take 12 credits of professional core classes in evaluation research, such as analysis of motor skills, in addition to 15 concentration-related credits. There is also a three-credit research project that serves as a capstone experience. Prime candidates for this program should have a minimum undergraduate GPA of 2.75 and a combined GRE score of 301. UNG features open enrollment each semester with classes offered on a two-year rotation. The University of Idaho’s online master’s of education in physical education and physical activity pedagogy is beneficial for full-time and part-time coaches. Students enrolled in this program learn about a variety of topics, such as movement, physical fitness, and teaching wellness for teachers and coaches; they also have access to pedagogical research opportunities. All classes are available online or at school's flagship campus in Moscow. The program also has a track that leads to a teaching certificate. This 30-credit degree offers classes for physical education in certain grade levels as well as adapted methods that can be used for coaching. The completion time is flexible and students can earn their degree in as little as one year. Distance learners also have the option to pursue research and directed study. Applications are accepted at three different periods throughout the year and eligible applicants should have a minimum 3.00 GPA or at least five years of experience in a related field. Located in Cincinnati, Ohio, Xavier University is known by many around the U.S. for its NCAA basketball tournament runs; however, this private, Catholic university is also a strong academic school and offers a master’s degree in coaching online for students interested in basketball and other sports. The master’s of education degree in coaching education and athletic development is a two-year program that is taught in a cohort format. Xavier’s program emphasizes coaching excellence, rather than focusing on physical education. The 33-credit curriculum is split into courses that teach three main topics: coaching pedagogy, long-term athlete development, and character development. Although coursework can be completed remotely, students pursuing this coaching master’s degree online must participate in two residencies (two or three days each) in order to take comprehensive exams and engage in professional development. Applicants should have a minimum 3.2 GPA and submit GRE or MAT scores. Greenville University is a small, private, Christian school in Greenville, Illinois; it offers a coaching master’s degree online. The master’s of arts in education for coaching program is suitable for coaches of all levels. Completable in two years, students learn about game strategy, performance analysis, administrative management, and how to optimize practices. The program also features courses in scouting. Greenville, which is affiliated with the Free Methodist Church, adds a Christian perspective to its education. Available only online, this 33-credit program contains courses in leadership, management, coaching evaluation, and issues in education. The program culminates in a capstone project where students undertake a coaching-related improvement project. Applicants should have a 3.0 GPA in their final 60 undergraduate credits and a bachelor’s degree. Students must also be active coaches with at least one year of experience. Pittsburg State University, located in Pittsburg, Kansas, offers its master’s of science in physical education degree online. The online degree includes three areas of emphasis: general physical education, human performance and wellness, or sports and leisure service management. This degree is suitable for physical education teachers, coaches, or recreational sports organizers. In addition to 15 core credits and five elective credits, each emphasis requires the completion of 12 concentration-related credits. Some of the emphases also require students to complete an internship experience. Distance learners can choose a thesis or coursework option to earn their MS degree. Applicants must have a minimum 2.7 GPA to be considered and submit a statement of goals, a resume, and two letters of reference. All applicants who are considered for admission must also interview with the department chairperson or a graduate coordinator. Eastern New Mexico University is home to a master’s of science in physical education program that emphasizes coaching. Students can obtain this master’s degree in coaching online without ever needing to attend the school’s main campus in the city of Portales. This program is best-suited for current educators and coaches who want to further their careers or become coaches at a higher level. The 36-credit program includes 18 credits of core classes in areas such as sports law, kinesiology, and applied sports psychology. Students can also take electives in a variety of topics, including finance, women's sport/wellness issues, and scientific principles of strength & conditioning. Internship and thesis options are available. Applicants must have of a bachelor’s degree and submit their GRE or MAT scores. The University of Southern Mississippi in Hattiesburg makes its master’s of science in sport coaching education available to students remotely. Distance learners pursuing this coaching master’s degree online learn about physical human development, leadership techniques, and coaching methods. This 36-credit program features 30 credits of required classes and the option for a six-credit thesis or a six-credit non-thesis practicum to conclude the degree. Students must also take a comprehensive exam. The program is designed for part-time learners, where students enroll in two classes at a time. It typically takes about two years to finish this program. A maximum of six credits can be transferred. Applicants must submit one set of entrance exam scores, a resume, and three letters of recommendation. Students must also have GPA of at least 3.0 to be considered for admittance. There is only one start date, at the beginning of the fall term, each year. The 36-credit program includes 12 required courses in subjects such as coaching finances, ethics and diversity, and foundations of sport coaching. Students also complete a guided independent study project. The curriculum is designed to fit a variety of sports and coaching styles and is best-suited for working coaches who are interested in attending classes part-time. The online application process does not require students to submit GRE or MAT scores. Students pursuing a master’s degree in coaching online at the University of Northern Colorado can graduate in as little as 18 months. The master’s of arts in sports coaching uses industry research to help working coaches implement new techniques/approaches into practices and team management. Open to coaches of any sport, the program combines traditional academic knowledge with cutting-edge technology. The 30-credit program can be started during any term and takes about five terms to complete. Core topics covered at UNC include sports education, injury prevention techniques, international coaching, conditioning foundations, and sports psychology. Distance learners complete a portfolio project rather than undertaking a capstone, thesis, or comprehensive exams. Applicants should have a bachelor’s degree and a minimum 3.0 GPA to be considered, but GRE scores are not required. A maximum of six credits may be transferred into this program. Concordia University - Irvine, located in Orange County, California, is a small, private, Lutheran university affiliated with the Concordia University System. The school offers its master’s in coaching and athletics administration (MCAA) program in online, on-campus, and hybrid formats. The MCAA degree program teaches students the leadership and tactical skills necessary for on-field coaching as well as the administrative knowledge needed to succeed in a front office. Students may transfer up to eight credits towards this degree. This 36-credit online program can be completed as a master’s of arts or a master’s of science degree. The curriculum includes 20 units of core classes and 16 units of electives, some of which are only offered online, such as biomechanics and nutrition. Advanced courses related to specific sports, such as wrestling or volleyball, are offered. Students also have access to a variety of internship opportunities. Distance learners complete a portfolio as a capstone project. Taught through the University of Missouri’s distance learning branch, Mizzou Online, the school’s online master’s of education degree in positive coaching embraces the concept of educating athletes while avoiding negativity. The 30-credit program can be completed online, where all students pay an in-state tuition rate, regardless of their residency status. Graduates are prepared for a variety of career options, ranging from academic advisers and school counselors to athletic and wellness coaches. Mizzou’s online master’s in coaching is taught in either eight- or 16-week sessions. The entire program can be completed in one or 2.5 years, depending on whether students are enrolled full- or part-time. The curriculum covers athletic administration, ethics in sports, coaching wellness, athlete well-being, and fitness conditioning. Applicants should have a 3.0 minimum GPA and a bachelor’s degree. GRE scores are not required for admission. Located just south of Omaha, Nebraska, Bellevue University is a private school with a large percentage of non-traditional learners. Among its many online programs, Bellevue has a master’s of science degree in leadership and coaching. Applicable to athletic coaching and business leadership, this degree can be used to further a wide variety of careers. The 36-credit program leads to a certificate of completion in executive coaching as well as an MS degree. The program features courses in strategic leadership, social psychology, and leadership theories, as well as executive coaching courses and internship classes. Tuition at Bellevue is the same for all online and on-campus students, regardless of where they live. Applicants should have a bachelor’s degree and a minimum 2.5 GPA over their final 60 undergraduate credits. Kalamazoo’s Western Michigan University has a coaching sport performance master’s degree that is available online. This master’s of arts degree is based on the "the eight domains of coaching," as established by the National Standards for Sport Coaches. The program is well-suited for current coaches of all levels, from youth to professional and Olympic. The 36-credit program includes 11 courses and can be completed in just 18 months, although distance learners have up to six years to earn their degree. Students learn communication, evaluation, conditioning, and administrative skills as well as methods for better injury prevention and more ethical coaching. There are three application cycles throughout the year in the fall, spring, and summer. Students must submit letters of recommendation and a resume as part of the application process, but GRE scores are not required. Adams State University is a public, liberal arts university in Alamosa, Colorado located near Great Sand Dunes National Park. The university offers its master’s of arts in coaching degree online. This program can be completed entirely remotely and requires no on-campus participation. Pupils learn about strategy and tactics as well as athletic law, fundraising, finance, and educational methods. Students pursuing this coaching master’s degree online typically graduate in about two years. Distance learners take two courses each term for six consecutive terms. A maximum of six credits can be transferred in and applied toward this degree. Coursework includes classes in sports law, leadership in sports, and exercise psychology. Students also engage in field-based research. In addition to its coaching degree, ASU offers related online programs in sports management and applied sports psychology. Jacksonville State University is a public university in northeast Alabama. The school offers an online master’s degree for coaches. The master’s of science in physical education is designed for current coaches and physical education teachers. Students can choose from concentrations in human performance, nutrition, and teacher education. The human performance track prepares students for future employment in strength and conditioning, adult fitness and wellness, and corporate fitness roles, while the nutrition program may be appealing to students who want to become dietitians. The teacher education track requires distance learners to work with students and is best-suited for current educators. The program consists of between 30 and 33 credits and is delivered through the Blackboard learning management system and LiveText. Each concentration features slightly different requirements. Applicants with bachelor’s degrees in exercise science or a related field are preferred. The program typically takes about two years to finish. There are several different types of master's degrees in coaching online. Some are offered as master's of arts degrees, while others are offered as master's of science or even education degrees. These programs are typically offered through either a school's education or kinesiology department. There are also some programs that focus on particular sports, while other focus on coaching a specific age range. When searching for the right program, you should research curriculum requirements, completion time, and accreditation status and compare the results with your long-term career goals. Applied Sports Psychology: Many programs offer psychology courses related to coaching. Students will learn about the psychology of an athlete while they're competing, preparing, and training. Coaches use sports psychology every day on the job, from designing a demanding practice to imitate the rigors of competition to understanding a slump from the team's star player. Exercise Science and Physiology: In this course, students learn how an athlete's body works and how it can perform better. Sports science and physiology can be combined to design cutting edge workouts that ensure athletes are exercising properly. There are many variations on this course, many of which include anatomy and biomechanical components. Instruction for Sports and Teams: Just as teachers learn various methods for creating the optimal lesson plans, coaching students learn how to best create short- and long-term lesson plans for their teams. Regardless of whether they're coaching high schoolers or professional athletes, coaches must learn the fundamental teaching methods needed to implement a winning mentality. Nutrition and Dietary Science: Nutrition experts are often on staff for college and professional teams, although it's a growing trend for coaches to be more involved in the whole experience for players. Nutrition in athletics is a defining characteristic of modern sports and has become integral at all levels. HOW LONG DOES IT TAKE TO GET AN ONLINE MASTER'S IN COACHING? A master's degree in coaching online can typically be completed in about two years. The exact completion time varies from program to program and depends on a variety of factors. Some students opt for part-time learning, which involves fewer classes per semester over a longer period of time. Many programs feature accelerated seven- or eight-week terms for classes while others use a more traditional semester schedule. Credit loads and learning format can also affect the length of an online master's in coaching degree. Most programs feature credit loads between 30 and 36 credits, which is typical among master's degrees. Program can be taught in either synchronously or asynchronously. Students in programs that use synchronous courses are typically organized into a cohort model, where they take the same courses in the same order as a group of other students. Other programs offer courses asynchronously online, allowing students to complete coursework at their own pace. This can mean a quicker completion time for motivated students, although they may lack some of the peer support that a cohort model provides. Licenses and certification for coaches may be required in certain states or in high-level positions. In fact, many high schools and colleges have specific requirements for coaches, such as requiring a teaching certification or license. Many schools also require coaches to have some first-aid certification. Additionally, some sports have their own licenses or certificates available,such as the National Interscholastic Cycling Association licenses for cycling coaches. One factor that distance learners should be sure to consider before selecting a master's degree in coaching online program is accreditation. Accreditation is a process whereby independent accrediting bodies decide whether a school or program has met a set of standards for that industry. Schools can be either regionally or nationally accredited. Regional accreditation means that a college or university has been accredited by one of six agencies (or the Higher Learning Commission) that serve separate regional sections of the U.S. Most public and nonprofit colleges and university are regionally accredited. National accreditation is less common and more often used to accredit for-profit universities or specific trade schools. Although most accreditation is handled by these six regional agencies, the Department of Education (ED) and the Council for Higher Education Accreditation (CHEA) also play an important role. The ED and CHEA preside over accrediting agencies and ensure that they are compliant with national education standards. Some states require legitimate accrediting agencies to become recognized by both the ED and CHEA to operate within the state. The ED is a government agency that is responsible for establishing policy, setting standards for universities and colleges, and providing financial aid. The CHEA is an national industry group composed of colleges and universities that supports the accreditation program currently in use. You can find a list of all accredited schools on the ED or CHEA websites. A master's in coaching sets job candidates apart from other coaches who have only attained a bachelor's or have no degree at all. Michigan State University notes that a master's in coaching shows that a coach has attained the highest level of knowledge in the field, including cutting edge techniques. It also demonstrates that they have an interest in continuing education. For coaches who teach as well, a master's in coaching or physical education can lead to increased salaries or promotions. Master's degrees are especially useful for finding careers in college sports, which have seen a drastic rise in salaries over the past few years. Advanced degrees are now part of the National Standards for Sport Coaches as developed by the National Council for the Accreditation of Coaching Education and SHAPE America. Online coaching graduates can expect their level of pay to be directly tied to the industry they go into. Professional and college coaches make a lot more money than their high school counterparts due to their team's lucrative television deals and large fan bases. Coaching graduates who transition into player representation may also earn a higher average wage. Most students who pursue a master's degree in coaching online want to become the coach of a college, professional, or high school team. However, graduates with a coaching master's degree online can choose from a wide variety of other career paths. A more personable coach may want to stay on the field with athletes, while a grad who loves the big picture might prefer a career as an athletic director. Coaches and scouts are responsible for leading a team of players, with those specific responsibilities varying drastically from sport to sport and at different skill levels. Some high school teachers coach on their spare time, while college football coaches can work 90 or more hours a week. Scouts work alongside coaches to find the best athletic talent. Scouts are critical to professional and college sport teams who have to maintain a talent pipeline. Athletic trainers are responsible for helping athletes exercise and condition properly. Trainers assist with injury care, diagnosis, and prevention at all skill levels. Professional and college sport teams may have several trainers, while a high school may only have one for athletes of all sports. Athletic trainer is a popular option for students with background in kinesiology. Referees and officials can work in a variety of part- or full-time roles. Officials ensure that games are played properly and in accordance with a sport's rules. These professionals are needed at all skill levels and are paid at different rates accordingly. Coaching students who care about nutrition and dietary needs may be interested in becoming a nutritionist. Nutritionists are responsible for educating athletes on the proper dietary restrictions needed to achieve success on the field. These professionals are needed in professional, college, and even some high school sports teams. Athletic directors are often former coaches. They are responsible for controlling the schedule and managing resources for all of a school's sports teams. These professionals perform many of the same roles that a school administrator does, except specifically for a school's athletic initiatives. Professional coaching organizations can help graduates network with fellow coaches around the country. Networking can allow coaches to find new young talent for their staff or hear about better career opportunities before a position is posted. Professional organizations host conferences where coaches can learn about news and cutting edge techniques. These organizations also offer discounts on equipment, spotlight leaders, and provide aid to members. Many professional organizations are only open to coaches of specific sports or those coaching at specific skill levels. The National High School Athletic Coaches Association is dedicated to the idea of coaches as leaders and role models for youth. They have a June Convention each year where they spotlight top coaches and work to keep coaches up to date on the latest news in the field. Countering the image of an angry, yelling coach many see on film, the PCA is dedicated to teaching students through positive techniques. Coaches who join can learn new coaching techniques and participate in many events hosted by the organization. The NFSHSA joins coaches, teachers, parents, and officials from all over to create a strong network. Members can take advantage of several professional development activities throughout the year. Even students who work full-time typically still need help financing their online master's in coaching program. Many students turn to federal or school-offered financial aid in the form of grants, scholarships, and loans to help with school. The first step is to fill out the Free Application for Federal Student Aid (FAFSA). Students can also take advantage of merit- and need-based scholarships at most universities. Some programs even offer work study programs for local online learners.